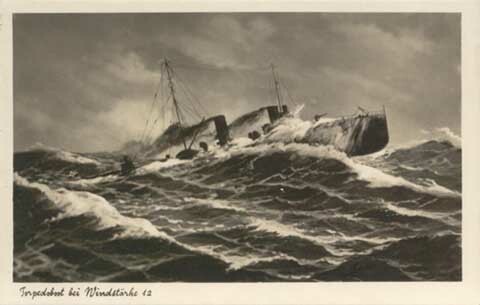 This card shows a German torpedo boat at sail in rough seas. The caption reads, "Torpedoboot bei Windstarke 12." The card shows a little bubbling (as if it had been rolled up) on the right side. It is only visible at certain angles. It is not a crease and all of the phot remains. Otherwise, the card remains in excellent shape. If you look very closely, you can see the Third Reich Kriegsmarine flag flying from the stern. This card has not been used. It does contain a marking by a previous dealer, but it is in pencil and could be removed if you chose to do so.